Commemorate a special occasion or milestone event with an engraved photo frame from Frederick Engraving. We have a selection of designs to perfect and personalize high-quality wood frames made of red alder. Classic wood color with a dark laser engraving will make your personalized photo frame pop and add a classic aesthetic touch to your home décor. Whether to get a little something for yourself or to create a perfect gift, customized frames are always appreciated and always used. An engraved photo frame is a fantastic way to remember a birth, wedding, or special event. Used as party favors or gifts, our customizable frames will make your memories last with a gift you’ll look at and smile, year after year. Our selection of frames includes three different sizes with glass fronts. All are equipped with hooks and an easel stand so you can place them on walls or tables without additional hardware. Monogrammed frames add a touch of class to those standard frames and make them uniquely yours! Ordering a personalized photo frame from us is easy! Simply enter your monogram or text, choose a style or font option, pick a frame size, and you’re ready to go. Frederick Engraving keeps many items in stock and available for quick shipping. No more trips to the mall, long waits, and minimal choices for customization. We have everything you need to create the perfect gift, no matter what the occasion or event! Browse our selection of engraved photo frames online and see just how many options are available to you. With our high-quality frames and precision engraving, these custom frames are sure to bring smiles and memories for years to come! 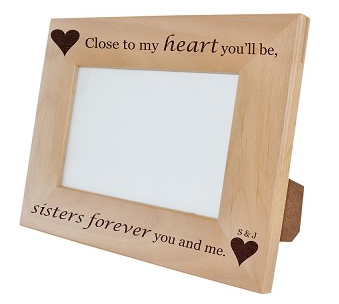 Shop Engraved Photo Frames Now !